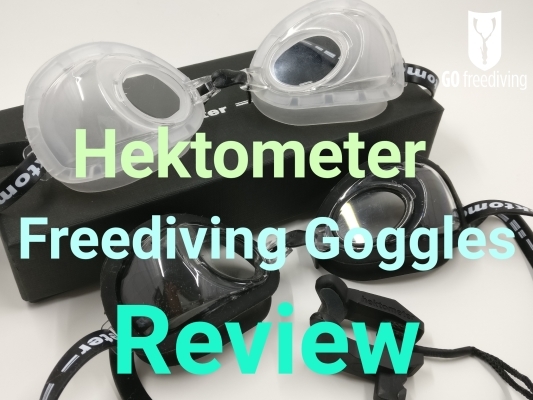 Hektometer freediving goggles are goggles that do not need to be equalised by the freediver! Hektometer freediving goggles started life as an Indigogo campaign and now a limited number are available to buy through Go Freediving. So why do we need goggles that can equalise themselves and how do Hektometer freediving goggles work? 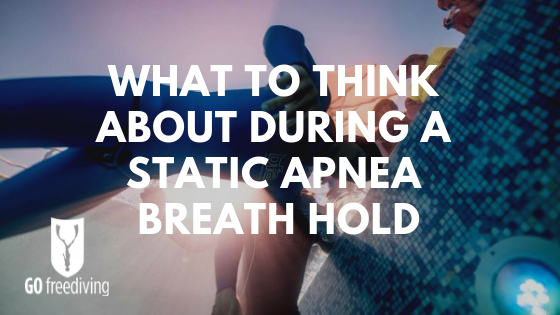 As freedivers, we all need to consciously move air into our middle ears and mask in order to equalise the pressure as we descend (the lungs and sinuses usually equalise passively so we don’t need to think about them). Boyle’s law states that ‘If the temperature remains constant, the volume of a gas is inversely proportional to the absolute pressure’. 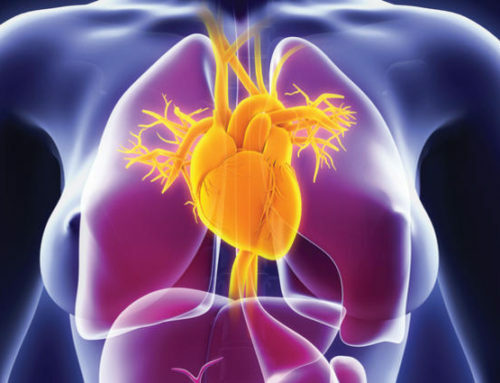 What this means is that the deeper we descend, the smaller the air spaces become in our bodies, and to prevent injury we need to move air from our lungs or our mouth into these spaces to bring them back up to the volume we had at the surface. Most freedivers use a low volume freediving mask with an integrated pocket for the nose. In order to equalise the ears, freedivers will usually pinch the nose and use either the frenzel or valsalva manoeuvre to create positive pressure and move air into the middle ear via the eustachian tubes. Some freedivers can (luckily!) equalise hands free by moving the jaw forward to open up the eustachian tubes. To equalise the mask however, all freedivers must allow a little bit of air to escape from the nose into the mask. 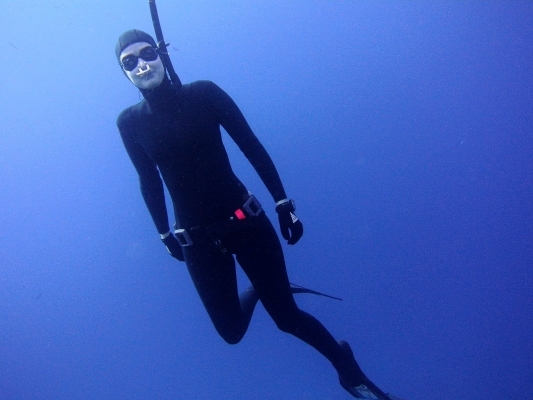 The greatest pressure changes are in the top ten metres, so by the time a freediver has reached 10 metres depth, the volume of air in their air spaces has halved. This means that 50% extra air has to be taken from the lungs and/or mouth and moved into the mask to compensate. 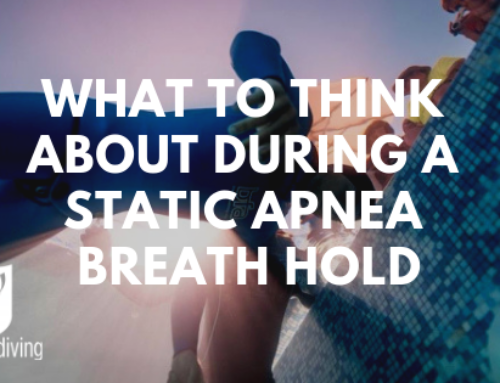 A freediver only has the air in their lungs for their dive and so every little bit of air (and the oxygen it contains) is vital to help prolong the dive or make it deeper. Putting air into the mask is often seen as a frustrating waste. In addition, if you need to touch your nose in order to equalise the ears, you must keep one hand by the mask. 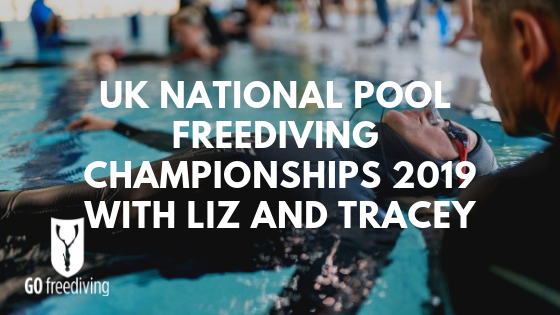 This breaks streamlining and if you are performing a no-fins descent (breast stroking down and back up) then having to use one of your swimming arms to equalise makes the descent to negative buoyancy more difficult. What about using fluid goggles for hands free equalisation when freediving? Solutions to hands free equalisation in the past have included wearing a nose-clip and not having any goggles or mask on at all, or using fluid goggles with a nose-clip. Fluid goggles are normal swimming goggles that have corrected lenses mounted inside them. You fill the goggles with sea water or saline solution and then put them on and open your eyes. The corrective lenses mean that you can see better under the water, and because the goggles are filled with fluid which is not compressible, the goggles do not need to be equalised. 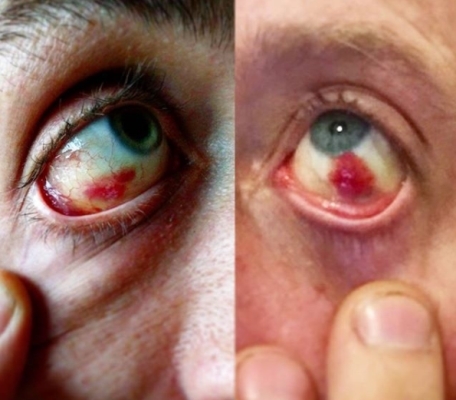 Disadvantages with using fluid goggles for freediving. Hektometer freediving goggles are air filled, do not need corrective lenses, and equalise without you having to do anything. How is this possible? So how do Hektometer freediving goggles work? The way that Hektometer freediving goggles work is simple yet ingenious. As you dive down, the silicone membrane inside the frame of the goggles moves inwards towards each eye, and water enters the outside through a small slot in the frame of the goggles to compensate for the reduced volume. This reduces the airspace inside the goggles next to your eyes. As you ascend, the air inside the freediving goggles expands, pushing the silicone membrane back outwards and expelling the water out through the slot in the frame. 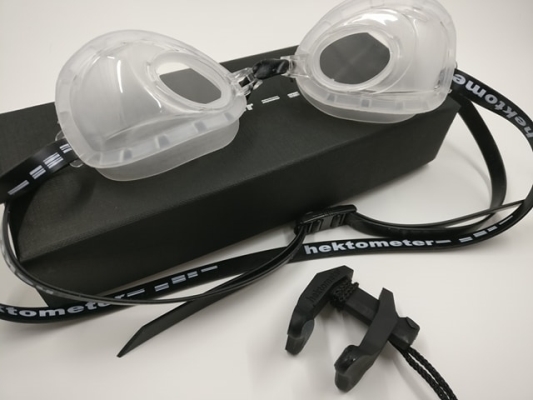 Hektometer freediving goggles equalise passively so you do not need to ‘do’ anything for them to equalise and protect your eyes. This is just amazing! So what does it feel like to wear Hektometer freediving goggles and how easy are they to use? I took a pair of the goggles and the accompanying nose-clip with me to the Red Sea in March 2018 on one of our freediving liveaboard holidays . This was an ideal environment to test Hektometer freediving goggles as we were in the water all week, both diving for depth and recreationally. In addition, I was teaching several courses and this gave me the opportunity to test the freediving goggles out in a real world situation and evaluate how they could fit into my teaching. What is the visibility like with Hektometer freediving goggles? When the goggles first arrived, I was so excited to get them, and so fascinated by how they were constructed and worked that it never crossed my mind to try them on and see what the field of vision was like. When you look at the goggles from the outside as compared to a low volume freediving mask, it looks as if the vision will be far less than a traditional mask. However, when I first put them on I was amazed that I could see just as much as I do using my usual freediving masks. This is due to the fact that the lenses are far closer to the eyes than a mask is. Wearing them in the water I completely forgot I was wearing them. The only reminder came when I remembered I had to put the freediving nose clip on. How do Hektometer freediving goggles feel when you are freediving with them on? 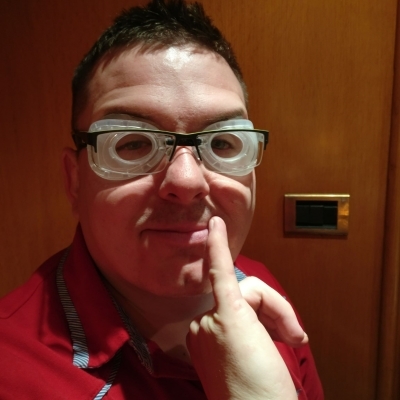 By the time you have descended to 10 metres depth, the internal airspace of the goggles has reduced by half. This means that the silicone insert has now moved into the frame towards your eye. I could feel this against my eyelashes but it was not uncomfortable, just a new sensation to get used to. Even when diving past twenty metres the silicone did not overly bother me, however it may bother some people and it is definitely a feeling that will be different with everyone dependent on the shape of their eye and eye socket. 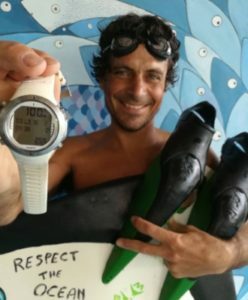 What is the Hektometer freediving nose-clip like? The Hektometer nose-clip is designed to be worn on any sized nose and can be tightened to any thickness and strength. It is small and low profile and can be easily taken on and off. It also has a lanyard so can be worn around the neck. My personal experience with the nose-clip was not so great. It worked fine out of the water, but when I was in the water, it keep slipping off and often didn’t make a tight enough seal. I tried using it in different positions, including upside down but unfortunately it still didn’t work for me and I had to put my fingers over the nose-clip to keep it on and pinch it tight enough to equalise against. I then tried a Trygons nose-clip (which we sell at Go Freediving) which worked better for my nose although still not perfectly. 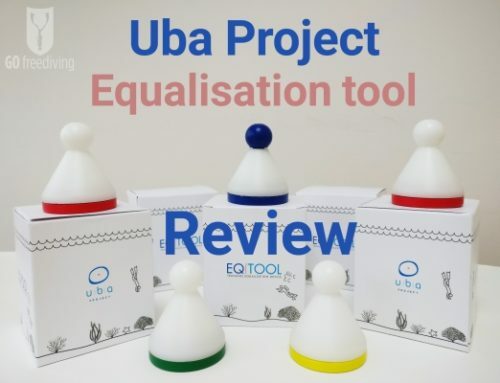 A massive proviso to this review here is that every person has a different sized and shaped nose and so the fact that the Hektometer freediving nose clip did not work for me does not mean that it will not work for you. In fact the reason that we at Go Freediving stock so many different brands of freediving nose-clip is that you may need to try different ones before you find the one that is right for you. 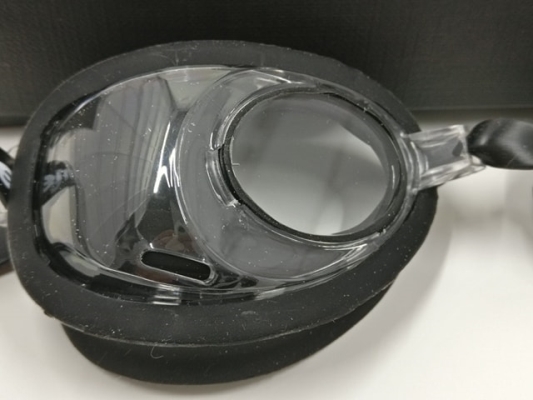 It is not possible to buy Hektometer freediving goggles without buying the accompanying nose-clip, however even if it does not fit you for depth, it will still be useful to have as a spare if you use a nose-clip for static apnea. Do the lenses of the Hektometer freediving goggles fog up and how do I look after them? With any pair of goggles or diving mask, you will need to use some form of de-fogging agent, or remove the protective coating that is often put on glass fronted masks. The Hektometer freediving goggles however have a very small surface area of plastic which is very close to the eye. I did not want to get out a lighter or toothpaste and risk damaging the integrity of the silicone seal. I also did not want to use a chemical de-fogging agent due to the fact it would be so close to my eyes. The best solution is to rub a little bit of saliva into the inside of the dry goggles, rub it around and then rinse it off lightly with fresh water. The goggles did fog up, but the quickest and easiest solution was to pull them down off my eyes and lick the inside of the plastic with my tongue. This ensured they remained clear for a good period of time, and when they fogged up again I just licked them again! In terms of their care, when they arrived they come in a stylish black cardboard box. This is okay for looking after them in a dry environment, but when you are out and about it will get wet and is easily crushed. After each time I used the goggles, I rinsed them in fresh water and then put them in a sealable tupperware container wrapped in bubble wrap. There was not an obviously safe place I could dry them between dives on the boat without the risk of them getting knocked, so they remained wet for a week and were absolutely fine. If you can, I would dry them after rinsing and then store in bubble wrap in a box, or in a solid goggles case. How deep can I freedive with Hektometer Freediving Goggles? David Carrera has freedived to 100 metres using Hektometer goggles and on the 11th of March 2018 dived to 105.5 metres (345 feet) using them. He has reported that he still experiences good visibility with them this deep. As every eye cavity is different, we recommend to use them very consciously below 40 meters / 130 feet. 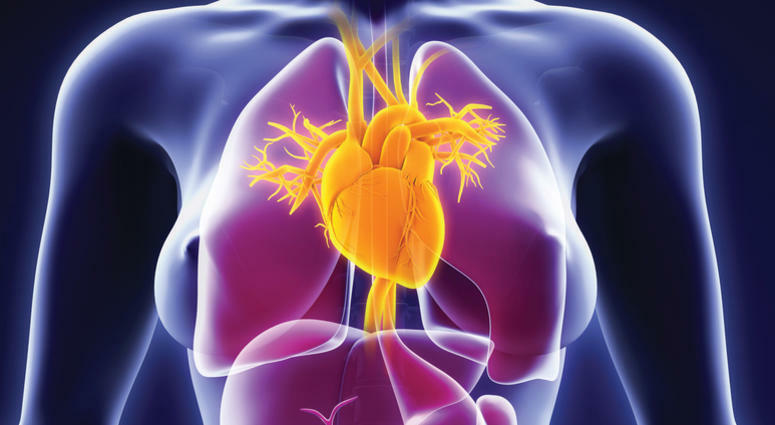 If you should experience significant negative pressure at any depth, do not go deeper! What are the advantages of Hektometer Freediving goggles? You have hands free equalisation! The dream of every freediver! Less risk of ear baratrauma as you can equalise all the time. So, during the duck dive you can equalise continuously, you don’t need to break the movement of the arms during a constant weight no-fins freedive descent, and you can keep the arms above the head for a streamlined constant weight with fins freedive descent. More frequent equalisation is also easier. More hydrodynamic. You are more streamlined and efficient through not having to break style to bring your hand to your nose to equalise. You can freedive dive longer as the air you would normally put in your mask is being used for oxygenating your body. 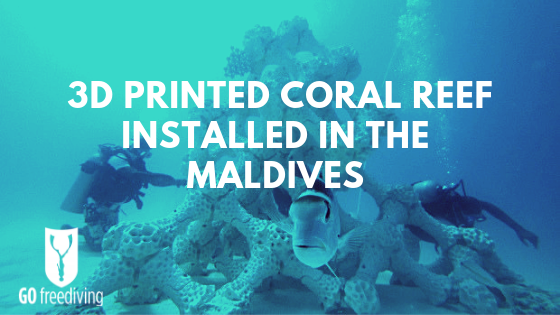 Your dives will be more relaxed as you have one less thing to think about. It’s easier to learn and practice mouthfill equalisation! What are the Disadvantages of Hektometer Freediving Goggles? They are expensive so you must be very careful not to damage them when you use them. You will need to make sure you find a freediving nose-clip that works for you if the Hektometer nose-clip does not fit. 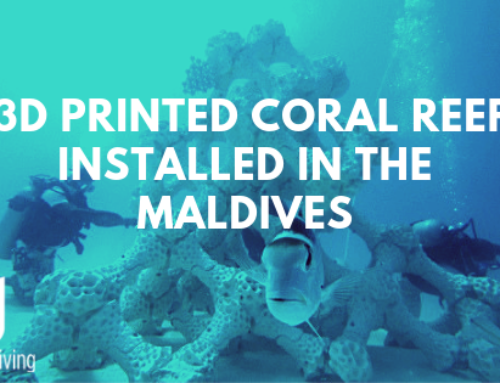 If you want to use a snorkel then you must either leave it at the surface when you dive or attach it to your head using a separate band of elastic or neoprene. When I attached my snorkel with a clip to the straps of the Hektometer freediving goggles, it got in the way, pulled at the goggles, and on a couple of occasions caused the goggles to leak as it pulled them away from my eyes. 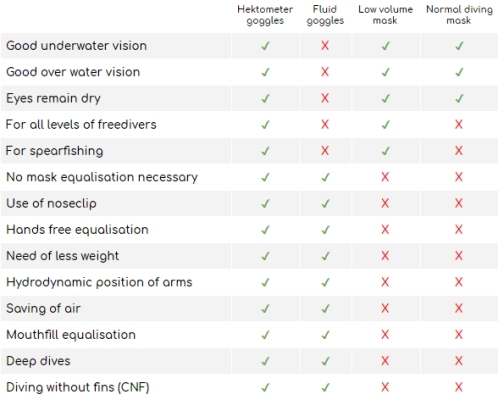 Here we can directly compare Hektometer freediving goggles with fluid goggles, low volume freediving masks and traditional, higher volume scuba masks. 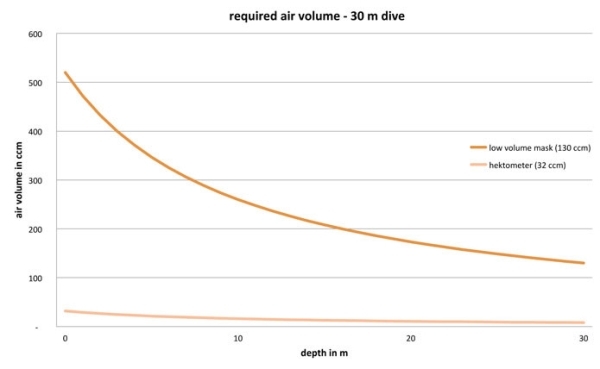 Tables comparing the volume of air needed to equalise a mask vs Hektometer goggles on a 30m and 80m freedive. 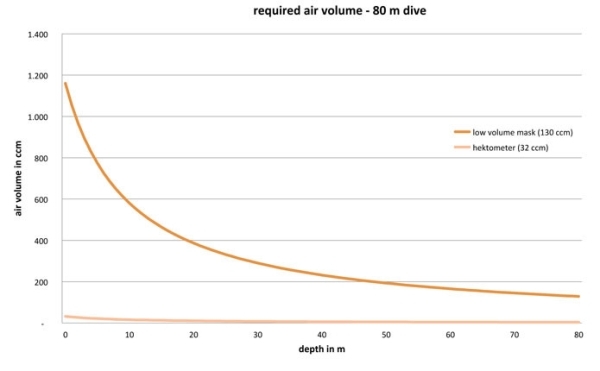 These tables show the volume of air needed just to equalise a low volume freediving mask as opposed to wearing Hektometer freediving goggles which do not need to be equalised at all. Freediving to 30 metres with a low volume mask, you need 520 ccm of air at the surface (130 ccm in the mask and 390 ccm in your lungs) for mask equalisation. This air in the mask will be compressed (30m = 4 ATM) to 130 ccm. However, wearing Hektometer goggles you begin with 32 ccm in the goggles, that reduces to 8 ccm at 30 m.
When diving to 80 metres with a low volume mask, you need 1170ccm of air (130 ccm in the mask + 1040 ccm in your lungs) for mask equalisation, compared to the 32 ccm in the Hektometer goggles that is reduced to 3.6 ccm at 80m depth. Both tables show that with Hektometer freediving goggles you have more usable air for freediving deeper and longer. Where can I try Hektometer Freediving Goggles and where can I buy them? You can try Hektometer Freediving goggles in the UK by appointment on Go Freediving courses and Club weekends . In Italy, you can try them with Marco Mardollo at Y-40, in Egypt, at dahab freedivers with Miguel Lozano LINK and also with Miguel in Spain, at Apnea Canarias. Go Freediving has a limited selection of Hektometer Freediving Goggles (with nose-clips) for sale. We have them in clear and black. Please specify when you order which pair you would like. I believe that Hektometer freediving goggles are one of the most revolutionary and exciting products ever to hit the freediving market. I absolutely loved using them, and the only issues I had were with finding an alternative attachment for my snorkel if I was diving with it, and finding a nose-clip that was right for the shape of my nose. Once I get those issues ironed out I will be using them all the time. For me, the biggest benefit was the fact that I could equalise throughout the duck dive. When teaching, I am constantly up and down with students usually to between 10 and 20 metres and back. These large and relentless pressure changes can take a toll on the ears when I am concentrating on my students or on filming, and with an efficient duck dive, even with a ‘pre-equalisation’ on the surface before the dive, the first underwater equalisation comes just a little too late. Using Hektometer freediving goggles, I could equalise constantly and I found that at the end of a week of freediving, my ears were as fresh as day one and my equalisation was easy. After our trip to Egypt I went to Abu Dhabi to teach freediving, and in one day racked up 48 dives with students, average depth 10 metres with no issues at all for my ears. This is a massive safety benefit and for me, the biggest selling point of these amazing freediving goggles. Once you have your Hektometer goggles you will want to take good care of them! They are sturdy, but may need some occasional minor repairs most of which can be done by you. Here are two popular examples.